Fourth Row Center: Film Writings by Jason Bailey: On DVD: "U2- Let Them Be: The Second Chapter"
Unauthorized music documentary DVDs are a bit of a snow job to begin with; as a general rule, they prey on a band or artist’s die-hard fans, assembling interviews with hangers-on and peripheral figures while carefully avoiding use of any of said performer’s actual music (licensing and all, y’know). But the manufacturers of these discs are sometimes capable of going beyond mere dishonesty. Take, for example, the 2008 release Inside Bob Dylan’s Jesus Years: Busy Being Born Again, which is not only guilty of the usual shortcomings (the director interviews an assortment of producers and back-up singers, to the music of his Dylan sound-alike band), but turned out, upon further investigation, to be entirely recycled from an earlier title. Which brings us to U2- Let Them Be: The Second Chapter. Issued by Chrome Dreams, a label that’s somewhat cornered the market on unauthorized U2 discs, it comes packaged in a double-thick cardboard sleeve, hiding the cases inside with a cover that deliberately recalls the Beatles’ Let It Be cover and back copy that contains very little information about what actually lurks within. There is a reason for this. Opening the cardboard, one discovers the actual content: two previously released discs. Yet nowhere on the packaging does it indicate that this is a repurposing job. The first of the two titles inside is the 2007 release U2- Achtung Baby: A Classic Album Under Review, an hourish-long examination of their bestselling 1991 album. As with its companion program, this is a production of Granada News, so they’re able to get away with using some music and video clips—provided they’re short enough to not violate rules of fair use. So the music snippets are brief, but at least they’re there, which is a big deal in the unauthorized doc world. We begin with brief background on the group, a zip through their early years, the revelation and smashing success of the Joshua Tree album, and the backlash to its follow-up record and film, Rattle and Hum. Dates and facts are provided by the somewhat overwritten narration; insight and analysis are provided by a host of music writers and scholars. They keenly pinpoint how, coming off of the American-infused Rattle and Hum, the group subtly shifted to more European influences (particularly David Bowie), and the dynamic that producer Brian Eno brought into the studio. 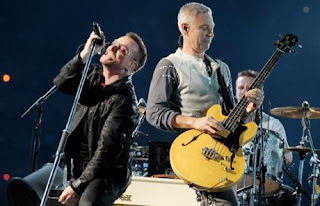 The band’s struggles over the sound of the new record are detailed, along with the high drama surrounding the leap of bootleg “work tapes” several months in advance. The bulk of the piece is a track-by-track analysis of the album—most of it trenchant and insightful, though it occasionally borders on trivial (we could probably do with a little less discussion of the album’s title and cover art). And much of this same ground is covered, with the input of the band and full music videos, on their official Achtung Baby home video (a VHS release, unfortunately unavailable on DVD). But overall, it’s a smart analysis of what Achtung Baby was—as a stand-alone work and within the arc of their career—and what it did. The second disc is U2: The Rebirth of Cool- U2 in the Third Millenium, which I reviewed separately last year (you can read that review here). The format is much the same—this time, picking up after the commercial and critical disappoint of the Pop album, which was too experimental for the rock purists and too traditional for the club kids. But somehow, by returning to the sound that put them on top, the band become one of the most commercially and critically successful artists of the following decade, and Rebirth of Cool tracks exactly how that happened. Again, the narration is a little over-cooked, but it does have some good background info; particularly interesting are the notes on the real people and events that inspired certain songs, the contrasting sounds brought to the albums by producers Brian Eno, Daniel Lanois, and Steve Lillywhite, and the specific manner in which the band became part of the American soundtrack in the aftermath of 9/11. As with the Achtung disc, it is the genuinely thoughtful analysis by the critics that makes it worth watching; the up-close discussions of the tracks on both the All That You Can’t Leave Behind and How to Dismantle an Atomic Bomb albums (as well as the side projects leading up to it) are well-reasoned and accurate. The Rebirth of Cool: U2 in the Third Millennium has its problems; as is expected, its lack of input from the band (they're only heard from in a few brief archival interviews) leaves it wanting for inside information (the closest they get is an engineer), and, at 68 minutes, it's just a touch too long for the material being covered. But both discs are still years better than most of their unauthorized brethren. Taken on their own, the two discs that make up U2- Let Them Be: The Second Chapter are pretty good critical documentaries—well-researched, with flashes of thoughtful analysis. Where it gets tricky is in the presentation; it is simply dishonest for Chrome Dreams to package this up like it’s a new product and leave consumers to discover, only when the plastic is off, that it’s all recycled goods. "U2- Let Them Be: The Second Chapter" is available now on DVD. For detailed A/V and bonus feature details, read this review on DVD Talk.